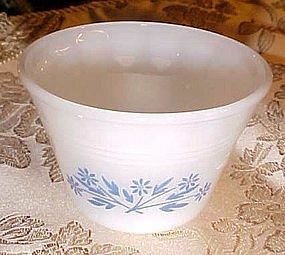 In glossy white milk glass with blue flowers, these 5 ounce custard bowls are marked Dynaware. DYNAWARE PYR-O-REY was made by Termacrisa (Vitrocrisa) of Mexico. This simple pattern was manufactured in the 60's and 70's. The little bowls are made with the floral pattern on the front. I have 6 available. Price is for each. All of the custards are in Excellent Condition without chips or nicks and pattern is bright and crisp. These are like our Pyrex or Fire King oven ware. In glossy white milk glass with brown flowers, holds five ounces. 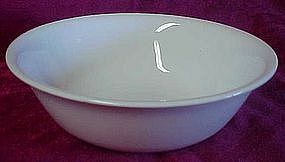 Custard bowls are marked Dynaware. DYNAWARE PYR-O-REY was made by Termacrisa (Vitrocrisa) of Mexico. This simple woodland pattern was manufactured in the 60's and 70's. The little bowl is made with the floral pattern on the front. I have 2 available. price is for each. Both of the custards are in Excellent Condition without chips or nicks. THese are just like our Fire King or Pyrex. 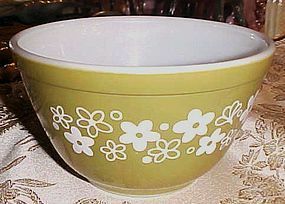 VINTAGE Pyrex Glass SPRING BLOSSOM Crazy Daisy Green Mixing Bowl with white flowers 1 1/2 QT. Good, better than average condition. Inside clean but scratches are evident when held up to the light. Green coloring is nice. I have 2 available. Price is per bowl. 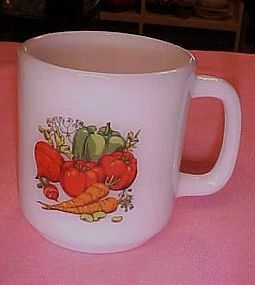 Vintage milkk glass Glasbake coffee mug with vegetable designs of radishes, peppers,carrots and beans. The mug is in great condition and look as if it were never used. There are no chips, cracks or issues that I can see and the graphics look great. 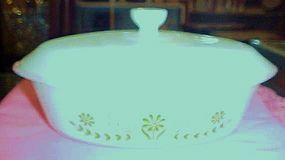 GlasBake, a sorta-cousin to Pyrex, round 2 1/2 qt casserole dish with lid in the green daisy pattern. Measures 8 3/4" wide plus handles and is 3" deep. I THINK it's 2 1/2 qts anyway. Marked ovenproof and microwave safe. Nice with no damages. I will be listing other pieces in this pattern. 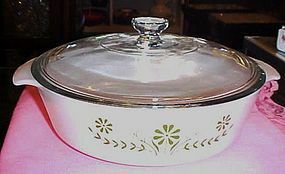 GlasBake, a sorta-cousin to Pyrex, oval 1 qt casserole dish with lid in the green daisy pattern. Measures 6 x 10 and 3" deep. Nice with no damages. I will be listing other pieces in this pattern. This particular Glasbake was made by Jeanette as the numbers show on the bottom J235. Fabulous Pyrex cup with in the Flamingo pattern, milk glass trimmed in flamingo pink/red (coral) with a touch of gold. 4 available, These are in great vintage condition with no visible wear, and no chips or cracks. Price is per cup. All are nice. All Four of them have a gold Pyrex stamp. 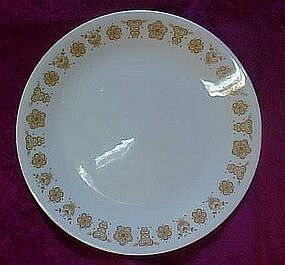 Corelle Spring Gold Butterfly - luncheon or salad plates are 8 1/2" diameter.made by Corning glass. The colors/patterns are bright and shiny, patterns raised. No chips or cracks. Some light utensil marks on these plates, the marks are lightly visible, but cannot be felt, they are not scratches in the plate surface. 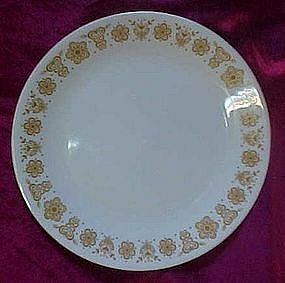 Please check my site for more Corelle in the Butterfly Gold pattern. 9 available, Price is for each plate. These go with the Pyrex in the same pattern. Thank You!! 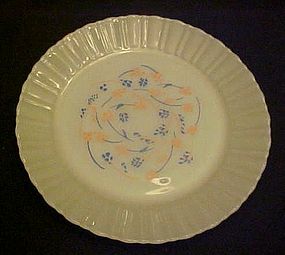 Corelle Spring Gold Butterfly - dinner plates, 10.5" diameter. The colors/patterns are bright and shiny, patterns raised. No chips or cracks. Some light utensil marks on these plates, the marks are lightly visible, but cannot be felt, they are not scratches in the plate surface. 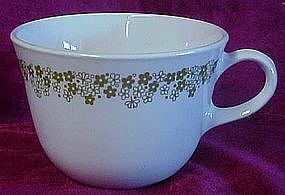 Please check my site for more Corelle in the Butterfly Gold pattern. 10 available, Price is for each plate. These go with the Pyrex in the same pattern.Thank You!! 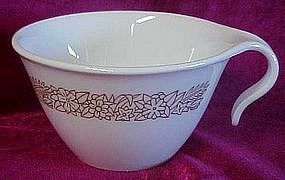 Nice Corelle cereal bowl by Corning in the Woodland pattern. These go with the Pyrex Woodland pattern. I have 4 of these bowls available, and all are very nice. Price is for each. 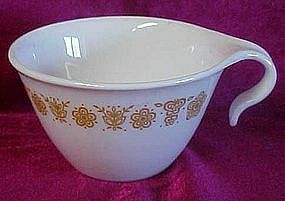 Nice cereal bowl is all white and would go with any of the corelle livingware. Made by Corning. Excellent condition. Only 1 available at this time. 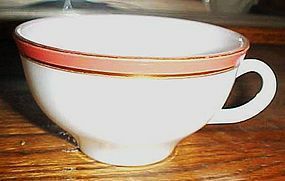 Nice coffee cups marked Correlle Living ware by Corning. 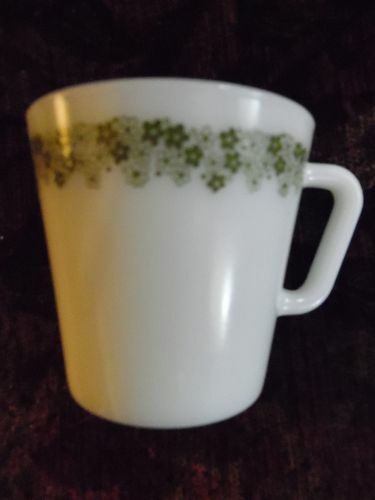 Cordinates with the pyrex green crazy daisy / spring blossom pattern pieces. I have 22 available and price is for each. All perfect and no stains. 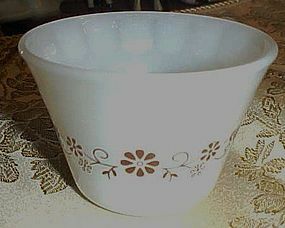 Corelle cup by Corning with the hook handle. Goes with the pyrex woodland pattern. i have 2 of these cups available. Price is for each. both are perfect. Pyrex butterfly gold pattern by Correlle Livingware. Hook handle cup is in perfect condition. I have 13 available in this pattern at this time. Price is per cup. I do have other pieces in this pattern I will be lising. Perfect condition. Here is the 1/4 lb covered butter dish in the butterfly gold pattern that was made by pyrex circa the 1950's-60's. The rectangular dish measures 6 7/8" wide and is 2 1/4" tall. The bottom is marked pyrex ovenware made in the u.s.a. Excellent condition.